I’m back with another 2018 LE Guerlain Terracotta bronzer: Sous Les Palmiers (translated as “Under the palm trees”). Guerlain released this in parallel with their Sahara Jewel bronzer (also LE), which I spoke about here. But unlike the Sahara Jewel which included a pink blush, Sous Les Palmiers has a healthy dose of coral blush placed in the pan beside the bronzer. 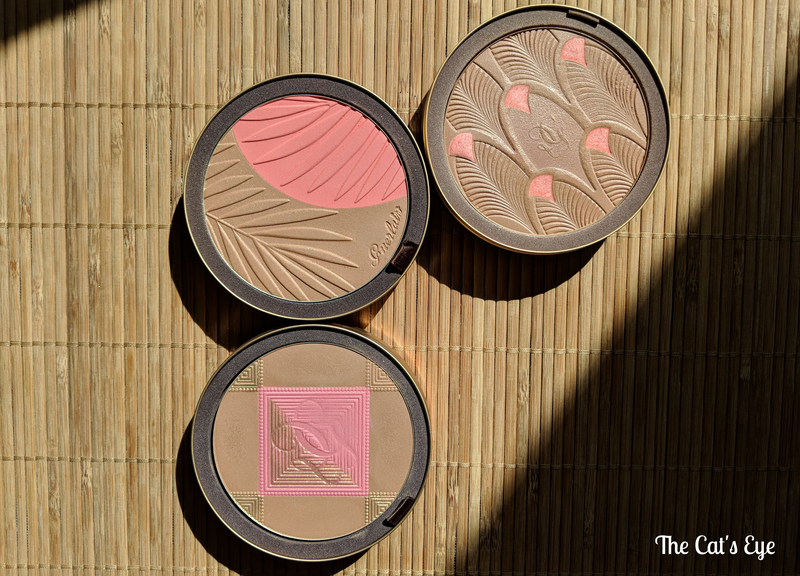 Guerlain’s Terracotta LE bronzers: Chic Tropic (18g, 2017, bottom left), Sahara Jewel (25g, 2018, bottom right), and Sous Les Palmiers (25g, 2018, top). Sous Les Palmiers follows in the footsteps of another couple of generously-sized LE Terracotta bronzers: Chic Tropic (discussed here), and Sahara Jewel (discussed here). Similarly to those, it comes packaged in a gorgeous metal tin which you can reuse to store small items after you finish the bronzer – assuming that’s even possible, with it being so huge! Another similarity between the three is the gold overspray… I know many of you aren’t fans, but it doesn’t really bother me. It dusts off very easily with just a few brush strokes… Above you can see pictures of both states: with / without overspray. The great thing about Sous Les Palmiers is the size of the blusher included with the bronzer. Its surface area would absolutely accommodate a regular-sized blush brush – which makes this product a very travel-friendly, 2-in-1 companion. Here are some swatches of the Sous Les Palmiers either alone, or beside its sister-release: the Sahara Jewel. Would love to hear how you think the coral compares to the pink!